Louie Dapra and his "mutt" Sam. Everyone is just crazy about their pets, especially if they have a dog. Each person has a story to tell of just how smart or special his own dog is, and here are a few I've collected recently. "Come here, Mutt, you're the MC!" Louie quipped as he opened the door for his dog to come in the house. Sam is half Australian shepherd, half blue heeler. Of all the dogs he's owned in the last 50 years, Louie Dapra thinks Sam is one of the best. He and Louie have moved cows for a number of local ranches. Sam minds well as long as there isn't another dog around and he's always watching Louie to see what he is supposed to do. Sam's age is showing now though. "Eleven years isn't so old but mileage is what's against him," observed Louie. "He follered me everywhere . . . knows this county real good, better than I do." Sam also acquired a limp three years ago, probably from "tangling with a moose." Louie worked for Barney Land and Livestock until this fall but Sam can't keep up anymore. "He done half the work anyway," Louie shrugged. "You don't realize how much you miss a dog until you ain't got one." 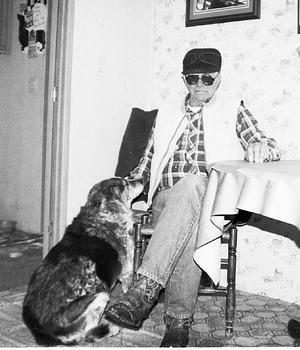 When Charlene Kallas was living west of Cheyenne, her family had a mongrel dog named Pe-pe.  Her brothers were drilling wells and Charlene stated that "Pe-pe knew the different tools by verbal command," whether it was a screwdriver or a hammer. They often laughed about the time Pe-pe got a tool out of the truck, beat up another dog on his way back , then without missing a beat delivered the tool to her brothers. Triple, Charlene's present dog, is also a retriever. Charlene made a number of trips to Fremont Lake to collect driftwood while Triple collected her own specimens. If Charlene threw the driftwood back in the water, Triple would reclaim the very same pieces and put them right back in her car cage. She believes Triple is a very smart dog. "Probably smarter than me," says Charlene, "I can't break her of jumping on people." 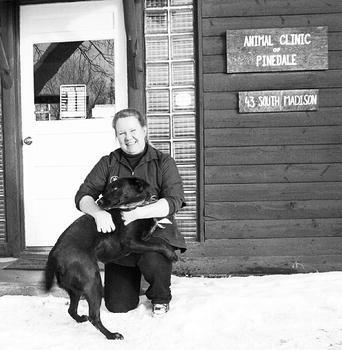 Charlene had Dr. Dean put one of her dogs to sleep because of internal problems and she asked Patti Baxley, a veterinarian technician at the clinic, to find another dog for her. That's how Triple, a black Lab, came into her life. "She took right to me," says Charlene. "I'm just crazy about her." Because of abuse as a puppy, Triple had her left front leg amputated before Charlene became her owner. Charlene remembers hearing what happened the day the bandage came off. Triple looked fixedly at the place where her leg used to be, then very deliberately she looked first at her former owner, then at Dr. Dean and finally at Patti, as if to say, "where's my leg?" Triple is very strong in the hind legs now and can pull herself up on top of the cliffs at the Lower Lake Road at Fremont. "She's just such a beautiful dog!" Charlene enthused. Tony Fagnant's dog Smoke went everywhere with Tony and he always seemed to know their destination. If it was time to be groomed or if he was sick, Smoke would hop right up on the examination table at Dr. Dean's clinic. On the other hand, if it was physical examination time he had to be dragged to the table. Patti Baxley said that sometimes Smoke would show up at the clinic without Tony. "Imagine a dog," reflected Patti, shaking her head, "smart enough to check himself into a hospital!" Smoke was run over when he was 17 years old. Tony still misses his old dog.. "I had him so long," Tony said, "everyone knew Smoke." Bonnie Pollard wears slippers in the house but changes to shoes when she goes out. Her Chihuahua, Pedro, hates it when Bonnie leaves him behind; so Bonnie ends up playing a game Pedro invented called "Where's My Slippers?" Pedro hides each slipper separately and never uses the same place twice. He hid them under her bed covers once. "He's a little dickens," Bonnie chuckled fondly. If she coaxes, Pedro brings the first slipper. He restores the second slipper to her when she urgently tells him, "My foot is really getting cold!" Bonnie is staying at the Sublette Center for a couple of weeks and today both of her Chihuahuas were with her. "That made my day good!" she said enthusiastically. Another trickster was Patti Baxley's dog Kizzi, a black Lab that died recently of old age. Outside the commercial kitchen at the old White Pine, as many as eight dogs would be lined up in the hallway quietly waiting for their after-dinner snacks. Kizzi repeatedly used the same deception to get rid of the other dogs. She would suddenly lunge at the back door, bark excitedly and thump the floor with her front feet, as if, said Patti, "there was great excitement outside." Caught up in the frenzy, the other dogs would race outdoors intent on finding whatever was so interesting. Kizzi then turned around and headed back to the kitchen. She planned on getting all those snacks for herself. 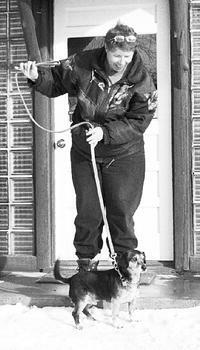 Nancy Merritt was 15 at the time she had a dog that was "part hound and who knows what else." Spot, as Nancy described him, was worthless, wouldn't mind and didn't do anything but follow her around and chase birds and rabbits. Barefooted and dressed in a sun suit, she went out to the pasture to get their Hereford/Holstein cows and one of the bulls, Nancy said, "took exception to it." Formally a bucket fed calf, the bull was unafraid of Nancy and before she knew it he had "flattened her." With a knee on either side of her the angry bull was trying to gore her with his horns but kept getting them hooked in the dirt. Spot came to her rescue. The dog grabbed the bovine by the tail and legs and "chewed on him hard" until the bull let Nancy go. Spot then kept him distracted until she could run for safety. "Sometimes I can still feel that hot breath on my stomach," Nancy confided. 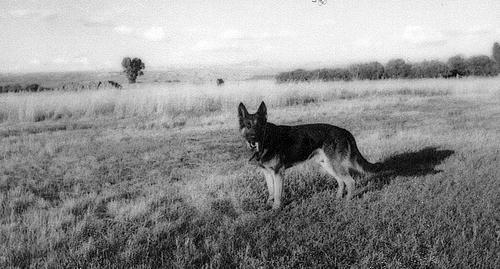 About 20 years ago Kay Malkowski became owner of Mike, a two year old German Shepherd that once belonged to a distant cousin. Though he'd had some obedience training Mike had never been on a ranch. "He was a natural," Kay stated, "an all around dog." He heeled (bit their heels) the cows and worked the chute (moved cows along). When she fitted Mike with a harness, he would give the kids a sleigh ride or pull a plastic sled loaded with wood or hay. He could pull as much as 200 pounds for a short distance. Kay related the time her dad, Phil Marincic, was guiding a couple of guys from Washington DC "or someplace back East" and the men managed to shoot a three point deer and "bust its leg." Kay went back to camp to get Mike, putting the horse's lead rope around his neck. She showed Mike the deer's trail and after that Kay noted, "it was just a matter of keeping up with him." Mike even followed the exact trail when the deer skirted around a log to spare its broken leg. They soon found the deer lying down and were able to finish it off. Mike had one bad habit that his obedience training didn't take care of. He killed chickens. "In fact," Kay mentioned as an afterthought, "I think that's why we got him." Mike showed his intelligence there too. He always waited to kill the chickens until the family was gone for several days. Nancy Merritt claims that Murray, their dachshund-Cocker spaniel mix, has a "good vocabulary and knows exactly what you are talking about." When Nancy took Murray to the veterinarian, she offered a biscuit to distract him. The dog ignored her, faced the door and with guttural whimpers pleaded to be let out. He knew he was going to have a shot. Murray has to sit on a rug while Nancy and Harold are eating. If, however, he thinks they aren't watching, he will "hitch" himself closer and closer to the table until Nancy gets after him. Then he slides back until his tail just touches the rug. If Nancy insists that he get completely on the rug he groans, reluctantly turns around and sits where he is supposed to. Murray was just three years old when he took over a new puppy's potty training. It was snowing and the puppy didn't want to go outside, so Murray grabbed Roscoe by the collar and forced him outside to relieve himself. Nancy explained, "Murray was afraid the puppy's accidents would be blamed on him."